Time zones are the enemies of all long-distance travellers. They are held responsible for the jet-legs, logistic errors and even for the accidental night phone calls to our overseas friends. You can blame the Earth’s rotation, of course. It spins on its axis showing different parts of the surface to the Sun. So we have to compensate for this effect by dividing the surface of our planet into 24 different sections, time zones, one hour or 15 degrees apart. We start at Greenwich (Prime) Meridian and if we move West, we subtract 1 hour for every 15 degrees longitude, if we move East, we add 1 hour for each 15 degrees longitude. Therefore there are 12 time zones East of Greenwich and 12 time zones West of Greenwich. 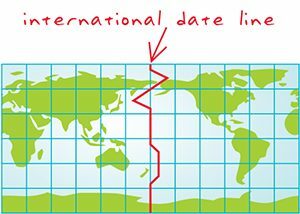 The line where they meet is called The International Date Line. If you travel across the Line East-to-West, you add a day, if you cross it West-to-East, you take away a day. I think we should call it The Time Travel Line instead! Well, at least that’s the theory of the time zones. In practice, this system is only used by ships in the International Waters (see Nautical time zones). The time zones in use on the dry land are not separated by 15 degrees. 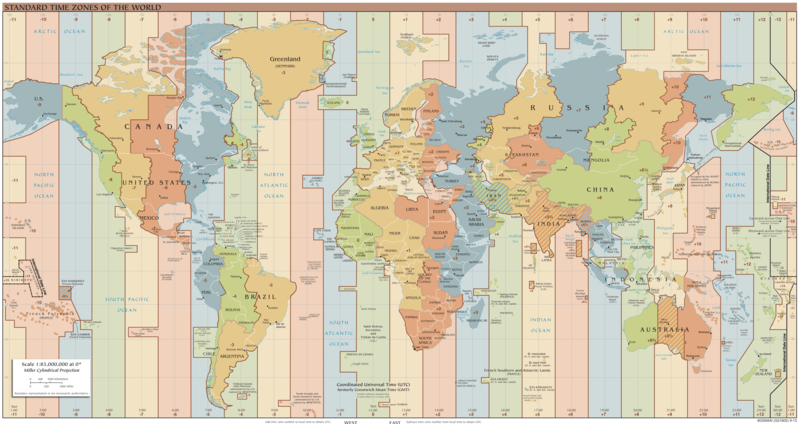 Moreover, not all time zones are separated by one hour: some are 30 minutes (India) or 45 minutes (Nepal) offsets. And even the International Date Line is not straight! Countries are free to choose what time zone they want to be in and, if there is more than one, to decide on the boundaries of the time zones within the country. Additionally, some countries observe the Daylight Savings Time and some not. The benefits of the Savings Time have been widely debated over for many years now. Russia voted to end the Daylight Savings Time in 2014. European Union is currently considering abandoning the “Summer Time” for good too. So not Astronomy defines where the time zones start and end, but politics, economy and even ideology. And some of the choices can make us raise an eyebrow. It is natural to assume that big countries will have several time zones. Russia, for example, stretches across 11 time zones! But some big countries, like China and India, only have one! In 1946 Mao Zedong introduced Beijing Standard Time across the whole China (as opposed to 5 different time zones that existed before) for the purpose of “national unity”. It must be really strange living in the China’s far West! Similarly, India, the country about 3000 kilometers wide, observes Indian Standard Time since gaining the independence from Britain in 1947. If you know your way around the World Map, you might think that Spain is in the same time zone as Portugal, UK and Morocco. Wrong! Spain is one hour ahead of Greenwich time. The country moved the clock forward in 1940 to match the time of their allies in Germany. Recently, Spain considered returning to the Greenwich Mean Time, but they have not yet made the decision. Samoa, the small island country in the Pacific, changed its time zone in 2011. The country “jumped” over to the other side of the Date Line in order to have the same time as its Western trade partners Australia and New Zealand. Now the Date Line looks less like a line and more like Harry Potter’s scar. Questions? Comments? Let our mobile planetarium team know!